The search was long and tedious, and i’ve written about my previous attempts to find a good gyros in San Francisco and how i kept finding one that was slightly better than the previous best. But somehow, finding a better one blinded me to the fact that it still wasn’t really what i’d call a top quality gyros. Umm, a brief digression. When i wrote “a top quality gyros” instead of “gyro”, i was not making a grammatical error. In my digging around about this treat i discovered that “gyro” is the nominative case, while “gyros” is the accusative case, which exhausts my knowledge of Greek grammar, but at least i now know to say, “I want a gyros” when i’m ordering one. Anyhow, my friend Mark is an inexhaustible font of leads to new and exciting inexpensive restaurants here in San Francisco. Like recently he mentioned on his Facebook page eating at a popup on 11th Street. Sounded so good i whirred down there and gobbled with great delight one of their garlic chicken tacos. Mentioned this to him, and suggested that we get lunch there. This time i tried their hamburger, and oh my goodness was it ever delicious. So yes, Mark’s culinary recommendations are worth trying. More recently he had a Facebook post about Souvla at 758 Valencia. Yep, a gyro place with a short menu consisting of pita sandwich or salad versions of chicken, pork, lamb, or veggie gyro (although i cannot imagine a veggie gyros). That plus a few sides: avgolemono soup, fries, or home style potatoes. A handful of soft drink choices, wine by the bottle only. But how is the gyro? It’s the best one i’ve had in San Francisco but still not as good as the ones i had in Hayward thirty years ago at a place i can no longer remember. One annoyance: they make you buy for a dollar a very small little paper cup of the absolutely essential yogurt sauce, and one is not quite enough, so i feel rather ripped off. I mean, this is like a steak house charging for the butter for your baked potato. Another annoyance occurred when i went back a second time, taking a friend with me and had to wait for them to open. The gyro this time was not nearly as good as it had been the first, when i was there in the middle of the afternoon. So i suspected that i got served last night’s reheated leftovers. I went back again in the afternoon to give ’em another chance, and it was back to the original quality. So just don’t go there before the early afternoon. And keep your eye open for a better gyros somewhere else where they will give you the yogurt dressing. 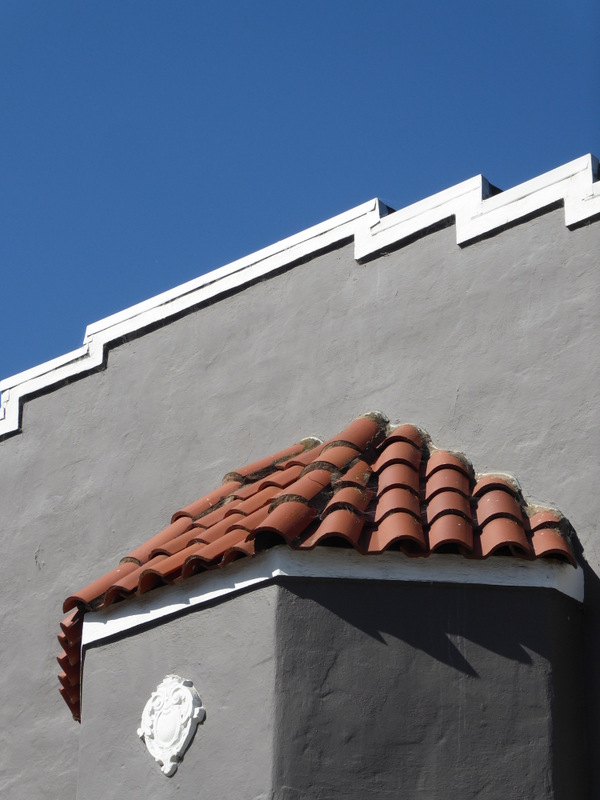 Meanwhile, here’s a red tile roof that caught my eye.